Bond paper roll (also called woodfree paper roll, normal paper roll) looks like ordinary white paper. It is made from the jumbo bond paper roll and used for receipt printers with ink ribbons, while thermal paper can be used for receipt printers without ink since it has the chemical coating on its surface. Bond paper has a specially treated surface that consistently produces images with high-resolution color prints, crisp lines, and high-contrast color, making it ideal for everyday black and color line drawings. Plus it is compatible with most HP designed printers. We manufacture and Supply Bond Paper Rolls at very good and Factory Prices. Now we can ship the bond rolls to overseas markets, such as Middle East, Africa, Europe, etc. Contact us now if you have any interest in our bond paper products. How to Measure a Paper Roll Size? We generally ship goods worldwide by sea. The products will be in a shipping container when arriving at the port. You are responsible for picking up your shipment and Customs clearance on your side. We currently accept T/T, Paypal, and Western Union. Please contact us if you have any questions about shipping or payment, we will be happy to assist you. The thermal label roll is a new addition to our production line in 2016! Thermal label rolls have an even wider market than thermal paper rolls, and we are now moving into the thermal label industry. Thermal label products are widely used in packing, shipping, identification, office, retail, equipment, containers, cartons….. almost every industry will use label roll products. 80mm Thermal paper roll is one of the most commonly used thermal paper sizes, used primarily in different transaction slip and bill printer machines.The print quality on thermal paper is clearer than on normal paper, and is less likely to fade. Also, thermal paper rolls are easier to handle than conventional paper. Thermal paper is more flexible and can be easily loaded and aligned in the printer. Our 80mm thermal rolls are of superior quality and fit many thermal printer brands, including Epson, Citizen, Posiflex, Samsung, Fujitsu, Axiohm, Star and many others. We can also print creative artwork on your paper rolls to make it a great marketing tool. Our 80mm Thermal paper is imported by countries all over the world: South Africa, Saudi Arabia, UAE, and many others. Samples are free for you to test before you place any order. Check out the 80mm thermal roll sizes below, and please contact us if you have any questions. ATM Receipt paper rolls are made from thermal paper that is used for receipts in ATM transactions. They are soft, smooth and white. The paper surface is coated with chemicals that can turn black upon heat. After the customer completes the transaction in ATM terminal, the terminal will print out the ATM receipt paper. 57mm Thermal paper roll is another popular paper roll size. The 57mm paper rolls have many advantages such as ease of use, light to handle, quick output, cost-effective, low maintenance, and long-lasting prints. 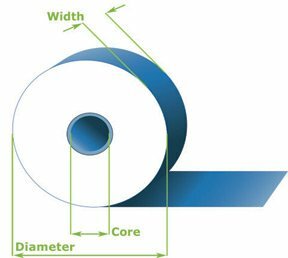 That’s why 57mm paper rolls are widely used in a variety of industries such as grocery stores, wholesale and retail stores, banks, fast foods and restaurants, they can be used as receipt slip, payment proof, parking tickets, betting terminal paper, etc. Carbonless continuous paper, also known as computer paper sheet, is made from NCR (no carbon required) paper, mainly used for receipt printer or dot matrix printer, it usually has many copies. The purpose of many copies is it can be kept by many parties. For example, when you check out in the hotel, the bill can be printed on the NCR paper, the customer can take away one copy, the front desk can keep one copy, and the hotel owner can inspect the financial condition by the copies. All Shipment is done by either Sea Freight, Air Freight and Land Transportation for nearby/Bordering Counties. ALL Payment for goods and commodity is 100% Fully Refunded back to customers if after Goods inspection is not upto international standards and as per our Specification. Double A Creation Co.,Ltd. is here and opened for new customers. Available 24/7 to assist you on your purchase and does so with loyalty and respect to all customers. Double A Creation Co.,Ltd.© Copyright 2018. All Rights Reserved. WELCOME TO DOUBLE A CREATION CO.,LTD.